All 9 members of the Measure N Oversight Committee have been selected to advise the city on the new tax revenue. 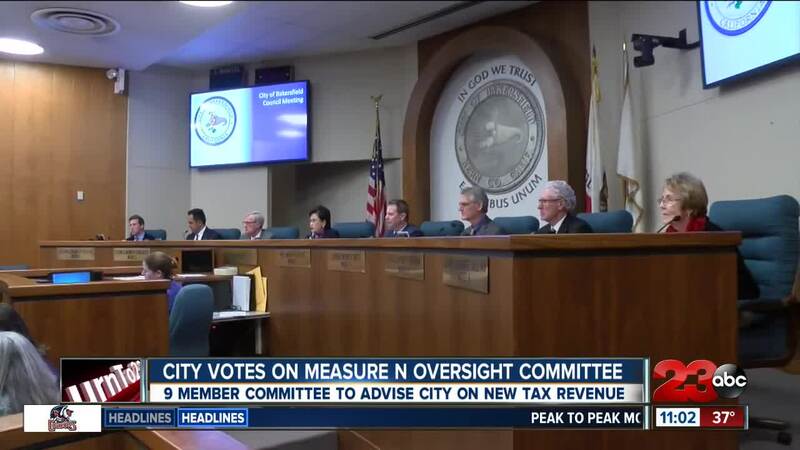 BAKERSFIELD, Calif. — All 9 committee members have been named for the Measure N oversight committee, which was voted on tonight at the City Council meeting. Several of the committee members represent prominent organizations in the city. Beatris Sanders is the President of the Adventist Health and Barry Hibbard sits on their board. Kenneth Keller is the new CEO for Memorial Hospital. Pritesh Patel is the Director of Global Business Development for the Comprehensive Blood and Cancer Center. Frederick Prince is chairman of the board of the Downtown Business and Property Owners Association. The committee will help decide how to spend millions of dollars raised by the new one-cent sales tax increase. Bakersfield City Manager Alan Tandy said that the committee will help make decisions on necessary services for the community such as public safety, homelessness and economic development. Measure N was approved by a narrow margin last year and will go into effect on April 1. The new tax is expected to generate about $50 million a year for the city.